If you had to choose just one species to take the prize for being the jewel in the crown of cichlids, which one would it be? For me, and for many others, it would be the ruler of Lake Tanganyika, the Frontosa Cichlid (cyphotilapia Frontosa). But why? Well, for many reasons which include its absolute beauty, majesty, and complex but captivating personality! Want to know more about these beauties, then read on and learn all you can from our complete care guide to the stunning Frontosa Cichlid. 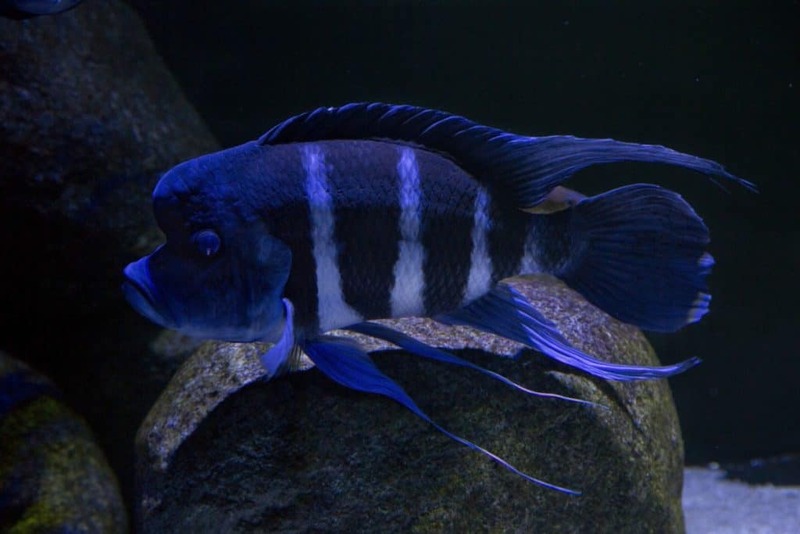 With its bold pattern of 5 to 7 broad black bands on a white and blue background, the Frontosa Cichlid has to be one of the most attention-drawing inhabitants of any aquarium. They are also, however, one of the most confused with the different variants often being mistaken for each other and mislabelled in pet stores. Unfortunately, identification is not the only area of this species that causes confusion. Many people believe that they are incredibly complex to care for and have all sorts of specialist needs, whilst others think they are incredibly simple to keep and don’t understand what all the fuss is about. The truth is, as usual, it turns out to be, somewhere in the middle and we’ll cover this in more detail later. But for now, here is the basic information you need to know. Size Average in home aquarium 10”-11” for Adults. Max size 13"
Where do Frontosa Cichlids come from? With a surface area of 12,700 square miles, Lake Tanganyika is the 2nd oldest, 2nd largest, 2nd deepest and worlds longest freshwater lake. Located on the African continent and spread between four countries; Tanzania, Democratic Republic of Congo, Burundi, and Zambia, it is home to over 250 species of cichlid including the Frontosa. Preferring shallower waters the Frontosa Cichlid is mainly found in large colonies along the sandy coastline of Lake Tanganyika. They are common at depths of 10 to 50 meters where unlike most cichlids who live under the cover of rocks they swim in the open. There they feed upon Cyprichromis (cyps) at dusk scooping them up when they descend to the bottom. With its common and scientific name referring to the hump on its head; cypho being the Greek for hunchback and Frontosa being Latin for the big forehead, it is easy to see what its discoverers in 1906 found most interesting and striking about this cichlid. However, I and others think that they certainly missed a trick in that the most striking feature is actually its coloration! 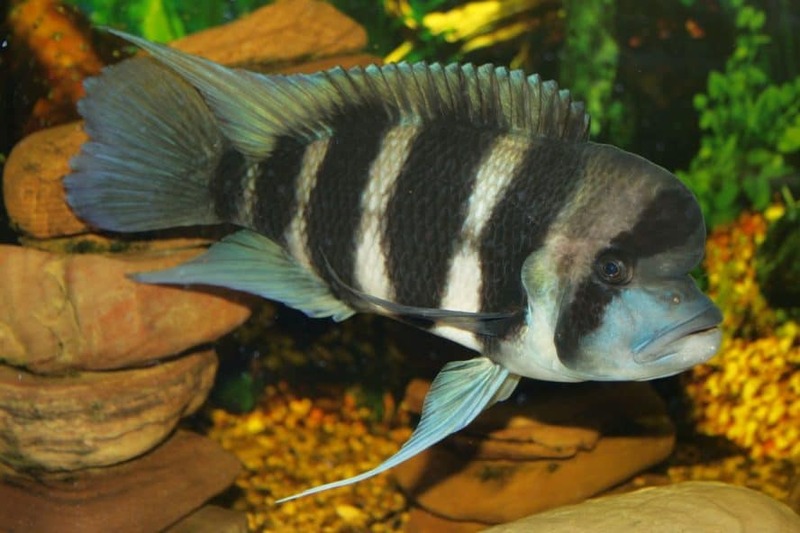 The Frontosa Cichlid has black and white vertical stripes and varying shades of blue highlighting mainly on its elongated fins. These shades of blue are opalescent, vibrant and extremely eye-catching. They do, however, vary as do the number of stripes depending on the Frontosa variety. 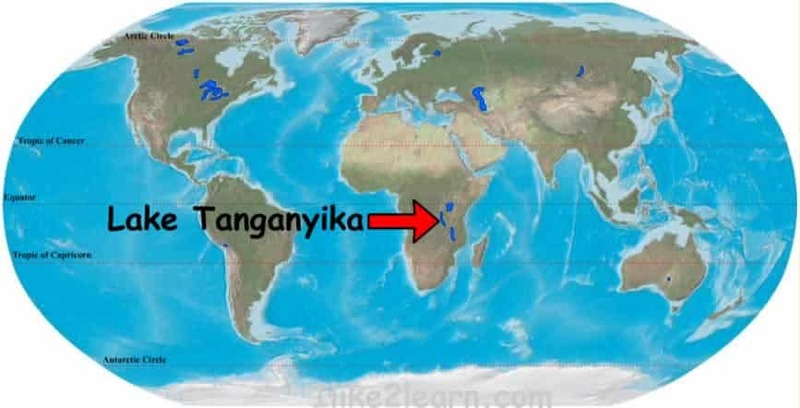 Due to the vast space that Lake Tanganyika covers there has been an isolation of distinct breeding colonies which has resulted in several variants of the Frontosa Cichlid appearance. These include the Kigoma, Bulu Point, Mpimbwe, Samazi, Kasanga, Chaitika, Kapampa, Kavala, Burundi, and Zaire Blue. Differences between the varieties are the number of stripes/bands, the shades of blue, placement of the blue and the appearance of a yellowish membrane on the fins of some. 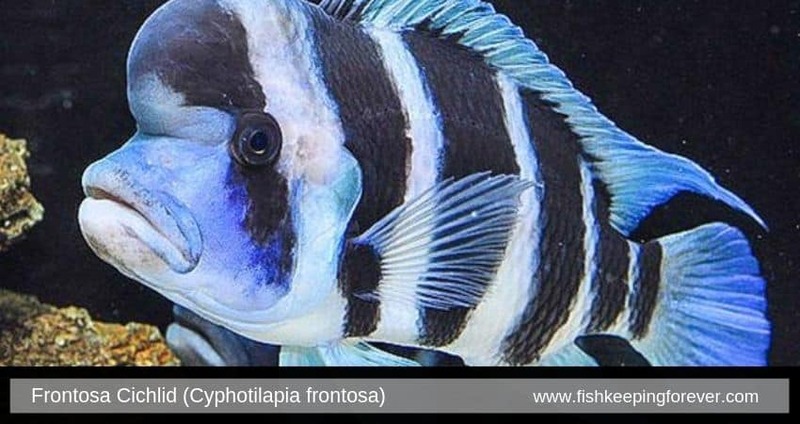 Most commonly found in the aquarium is the Burundi Frontosa Cichlid which has six stripes, a high body and good amounts of blue highlighting. The most sought-after and rare is the Zaire Blue which is highly acclaimed for it being the Frontosa Cichlid with the most beautiful shades of blue that can appear almost purple. 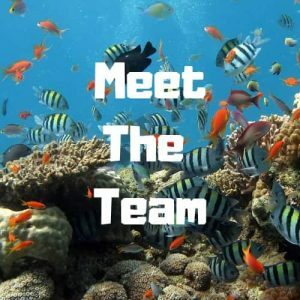 Are Frontosa Cichlids aggressive or peaceful? 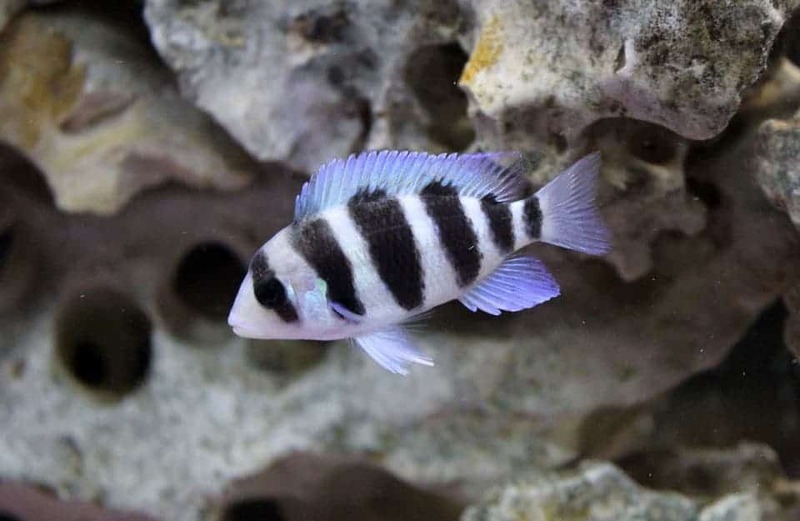 Reports of Frontosa Cichlid behavior vary with some aquarists referring to them as being similar to an Oscar that will wag its tail at the sight of its keeper and feed from their hand. Others say they are highly aggressive habitat destroyers that prey on other members of the aquarium. The truth, however, as per usual, is somewhere in between. There is no doubt that the Frontosa Cichlid is a semi-aggressive species that will in general rule their aquarium. This is partially due to their large size when fully grown, up to 1 foot 3 inches, and partly due to their natural tendency to be territorial. They are, however, believe it or not, one of the calmer of the African Cichlids that are fairly tolerant of other fish. This probably stems from the fact that they share Lake Tanganyika with over 250 other species of Cichlid and 80 species of non-cichlid fish! Whilst most of the aggressive behavior the Frontosa Cichlid may display is down to other fish encroaching on their territory they are also predatory in a lazy way! They are an ambush predator that lies in wait for smaller fish to swim by them such as their favorite meal Cryps scooping them up as they pass. They also do not expend much energy swimming, preferring to be still most of the time. When they do swim, they are slow with a tendency to be clumsy. Clumsiness, however, cannot explain away all the aquarium re-scaping that a Frontosa Cichlid will do when your back is turned. Yes, Frontosas are well known for redecorating their aquariums to how they want them and not you. This includes knocking over ornaments, uprooting, but not eating, plants and shifting the substrate around. Frontosa Cichlid can and will destroy a beautifully aqua-scaped aquarium in minutes whether there are six of them or just one! Speaking of numbers of Frontosa Cichlid in an aquarium, how they behave with each other will depend on getting the numbers right! Six to eight is the recommended amount with just one of them being male. Frontosa Cichlid aquariums work best run in a ‘harem situation’. Smaller numbers can also be successful such as one, four or five but trios and duos will not be. Human interaction, on the other hand, with the Frontosa Cichlid is very hit and miss. Some owners have big friendly Frontosa that will appear to be happy to see their human keeper and swim to greet them. Others, however, say that their Frontosa are shy and may even retreat into hiding as they approach. There is no rhyme nor reason that can explain this other than the thought that like us humans, every fish is different. The minimum tank size for a Frontosa Cichlid is 70 US gallons with 6 to 8 requiring 150 gallons at least. Water parameters should be kept between 72-78℉ (22-28℃), pH 7.8-9.0 and KH 10-20. Frequent water changes are needed in Frontosa Cichlid aquariums to maintain stable water which is rich in dissolved oxygen. Flow rate should be low also to match their natural habitats slow moving water. Decor-wise since Frontosa Cichlids are the masters of re-scaping the aquarium it is best to keep things simple. Sand is the best choice for substrate since Frontosas are known to sift it and move it around. Plants can also be used but are of little benefit and may be uprooted so be prepared to keep replanting them. Rocks and caves are, however, a good idea as Frontosa Cichlids can be skittish and require a place to hide. They also need a place to retreat when others are showing aggression towards them making rocks and caves even more important. Lighting in the Frontosa Cichlid aquarium should be kept low as they do not need nor like bright lighting. Failing to provide low lighting can result in stress and anxiety which will show on your Frontosa Cichlid as a darkening in their color. This may also occur when Frontosas are being bullied by other Frontosas or fish. Though Frontosa Cichlids are not particularly known as jumpers they can and will jump should they feel threatened or stressed. This makes a secure fitting lid a necessity. Be aware, however, that Frontosa Cichlids can get incredibly stressed during maintenance of their tanks when the lid of their aquarium is likely to have been removed. For this reason, it can be sensible to remove Frontosas from their tank during this time. A word of warning should you decide to perform partial or full aquarium maintenance with Frontosa Cichlids in their tank; they can react aggressively. I personally have taken a couple of bites and have several ruined nets that my Frontosa male waged war on! Adding Frontosa Cichlids to an aquarium can be done in a couple of ways to ensure that you acquire the ‘harem’ set up of several females to one male. Firstly you can buy older Frontosa Cichlids that are already established as a group ensuring you get the right mix. It is not that common, however, to find sales of such. The second option and the best is to buy 12 to 15 fry and allow them to reach maturity. Once they have, you then need to start removing excess males which will be somewhere close to 50%. Start by removing the largest male and selling him on allowing another male to become dominant. Repeat this process every few months until you have just one male and several females. This is undoubtedly the best way to get a well-balanced group of Frontosa Cichlid. What do Frontosa Cichlids eat? As we already know Frontosa Cichlids are carnivorous ambush predators that expend little energy to catch food in their natural habitat. This is also true of the aquarium Frontosa who will not come to the surface to eat floating pellet or flake. Of course, there are always exceptions to this rule but they are rare and most Frontosa will only eat sinking foods that pass nearby their mouths. With this laziness in feeding in mind, the Frontosa Cichlid is best fed a diet of mysis shrimp, krill, prawns, earthworms, artemia and small fish that will slowly sink to the bottom of the aquarium. Avoid bloodworm as there is some evidence that they can cause the Frontosas bowel to inflate resulting in poor motion coordination and even floating to the surface. Beef and chicken are also not suitable for the Frontosa Cichlid diet as these may cause fatty deposits. One of my favorite foods to feed my Cichlids when they are juveniles is Aqueon Mini Cichlid Pellets and when they become bigger or even adults we switch to Tetra Pro Extra Large Cichlid Pellets which has natural color enhancing ingredients. Despite being lazy feeders Frontosa Cichlid will overeat at every opportunity they are given, so it is best for them to have a six-day feeding schedule with one day off. This will help them avoid developing constipation, swim bladder disease and obesity. We have reviewed the Top 10 Cichlid foods to help you find the best diet for your Frontosa Cichlid. How difficult is it to breed Frontosa cichlids? It is not simple to differentiate between the male and female Frontosa Cichlid but a general guide would be that the male tends to be larger and have a larger cranial hump. This, however, will not become apparent until they are approximately three years old and reach maturity. It is around this age that they will also start breeding. Frontosa Cichlids tend to breed fairly easily in the aquarium environment and rarely need a breeding set up. They are mouth brooders with the female carrying the eggs and the fry before releasing them into the aquarium. They may, however, take their fry back in their mouths at night or if they sense danger for several weeks after release. The egg stage of Frontosa Cichlid breeding lasts for around 40 to 54 days before they hatch into fry that averages around half an inch. They then stay in the female’s mouth for around 28 days. Males have little to do with the process other than fertilizing the eggs and providing some protection for the fry once released from the female’s mouth. What fish make suitable tank mates for Frontosa Cichlids? Ideally Frontosa Cichlids should be kept in a species only tank but this doesn’t mean that they can’t be part of a community environment. Bear in mind when choosing tank mates, however, that they should not be small enough to fit in your Frontosa Cichlids mouth and that they should be slow moving and peaceful. Possible candidates for tank mates include Plecostomus, bichirs, other African cichlids and other Lake Tanganyika species of fish. You may also have success with mid to top aquarium dwellers as Frontosas tend to inhabit and build territory in the lower half. There are a number of Frontosa varieties depending on geographic regions. With a variety out there to suit everyone’s aesthetic tastes the Frontosa Cichlid has to be crowned the true king/queen of the cichlid world and is a must-have for every serious aquarist. They are big, bold and full of individual personality. Though highly popular in the aquarium world many people may be put off keeping this species because of its moderately difficult rating to keep. This label, however, is very misleading and perhaps unjust since they are a fairly hardy fish that have little or no specialist requirements. It would be my advice to bite the bullet and go ahead and get yourself a tank full of this regal species. After all, there is nothing quite like the show-stopping sight of an aquarium full of Frontosa Cichlids displaying their true colors! If you liked this post then you may also like our post about Silver Arowanas and also our most popular article Coolest Freshwater aquarium fish. Love this article – in particular their breeding and caring for their fry!! They make great parents and are one of the easiest cichlids to breed. The adults show amazing colors just before mating and throughout the breeding process.